I am a BACP accredited counsellor with many years experience of counselling adults and young people in all kinds of personal and emotional difficulty. I offer you professional and focused support in an environment that is confidential and non-judgemental. I will listen with respect and help you to talk through whatever is worrying you. Using my training, skills and experience, I can help you to gain a better understanding of yourself and your feelings, to think things through and find a way forward. I firmly believe that even the most difficult and long standing problems can be alleviated given the right support. When we meet for a first counselling session, we can talk together about your reasons for coming to to counselling and you can ask me any questions you may have. Some people find that just a few sessions of counselling is enough to help them through a crisis or resolve a specific problem. For others, where the problem may be more deep-seated or rooted in the past, longer term counselling may be more suitable. We discuss this together and there is no pressure on you to commit to more than you want. How do I book a first session? You are very welcome to ring me to discuss your situation or book an appointment. If I am not able to answer your call, my phone has a confidential answering service. Alternatively you can contact me by email and I will get back to you as soon as possible. I qualified in 2002 with a post-graduate Diploma in Professional Studies, Counselling from the University of the West of England. In 2003 I gained my Certificate in Counselling Supervision from the University of Wales, Newport. I am a Registered and Accredited member of BACP (British Association of Counselling and Psychotherapy) and abide by their Ethical Framework. As well as working in private practice, I have experience of counselling people in a variety of voluntary organisations, charities and in the further education sector. I charge £40 for a 50 minute session. I offer supervision for counsellors at the same rate. Some concessions may be available. 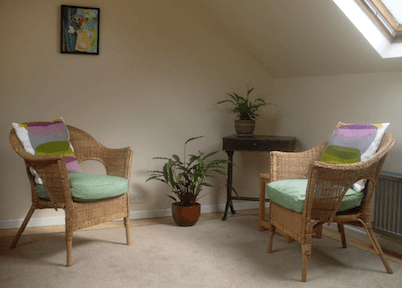 I work from a quiet and comfortable room in Hanham, Bristol. It is close to the No.44 bus route and easily accessible from Bristol, Keynsham and Bath. I have some availability to offer counselling at the client's home for people who are unable to leave their home through illness, disability or caring commitments. I provide counselling supervision to counsellors and counsellors-in-training from my private practice in Hanham, Bristol.